Loxwood manager Gareth Neathey pointed to the positives of a number of promising performances from some of young players despite admitting they deservedly crashed out of the FA Cup. The Magpies travelled to Southern Counties East League side Erith Town for the preliminary round replay on Monday night and suffered a 4-1 defeat. That was after an 81st-minute equaliser from Matt Hards at Plaistow Road nine days previously had forced an second meeting due to a 1-1 draw. But Erith crashed four goals in the first half, including a hat-trick from winger Steadman Callender, to book their place in the next round against either Raynes Park Vale or Spelthorne Sports. 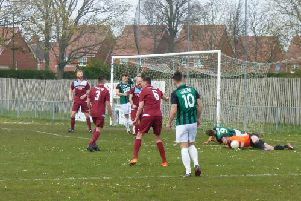 Adrian Stone had got the opener and a consolation for a battling Loxwood was Michael Death’s strike nine minutes from time. Neathey said: “Again it was a tale of two halves. We were brilliant in the second half but we did go down their with a handful of youngsters. “A few 16 and 17 year olds actually started and played really well so that was pleasing. “Individual errors cost us in the first half and that meant we were 4-0 down, but in the second half we played really well and got a goal back. “We didn’t deserve anything out of the game as such but it was pleasing that the youngsters all played 90 minutes and did really well. Loxwood: S.Smith, Courtney, Warren, French, Hards, Maunder, Joels, Swaine, Neathey, Bennett, Jardim. Subs: Death, Colbran, Wood, Baxter.